I wonder if those same brain rhythms, supplemented by voice as in the anthology Let Me Tell You a Story, might enhance the reading experience for people whose reading is interrupted by stumbles over unfamiliar words. The article below is re-published with permission. When we talk face-to-face, we exchange many more signals than just words. We communicate using our body posture, facial expressions and head and eye movements; but also through the rhythms that are produced when someone is speaking. A good example is the rate at which we produce syllables in continuous speech – about three to seven times a second. In a conversation, a listener tunes in to this rhythm and uses it to predict the timing of the syllables that the speaker will use next. This makes it easier for them to follow what is being said. Many other things are also going on. Using brain-imaging techniques we know for instance that even when no one is talking, the part of our brain responsible for hearing produces rhythmic activity at a similar rate to the syllables in speech. When we listen to someone talking, these brain rhythms align to the syllable structure. As a result, the brain rhythms match and track in frequency and time the incoming acoustic speech signal. When someone speaks, we know their lip movements help the listener, too. Often these movements precede the speech – opening your mouth, for example – and provide important cues about what the person will say. Yet even on their own, lip movements contain enough information to allow trained observers to understand speech without hearing any words – hence some people can lip-read, of course. What has been unclear until now is how these movements are processed in the listener’s brain. This was the subject of our latest study. We already knew that it is not just a speaker’s vocal chords that produce a syllable rhythm, but also their lip movements. We wanted to see whether listeners’ brain waves align to speakers’ lip movements during continuous speech in a comparable way to how they align to the acoustic speech itself – and whether this was important for understanding speech. Our study has revealed for the first time that this is indeed the case. We recorded the brain activity of 44 healthy volunteers while they watched movies of someone telling a story. Just like the auditory part of the brain, we found that the visual part also produces rhythms. These align themselves to the syllable rhythm that is produced by the speaker’s lips during continuous speech. And when we made the listening conditions more difficult by adding distracting speech, which meant that the storyteller’s lip movements become more important to understand what they were saying, the alignment between the two rhythms became more precise. In addition, we found that the parts of the listener’s brain that control lip movements also produce brain waves that are aligned to the lip movements of the speaker. And when these waves are better aligned to the waves from the motor part of the speaker’s brain, the listener understands the speech better. This supports the idea that brain areas that are used for producing speech are also important for understanding speech, and could have implications for studying lip-reading between people with hearing difficulties. Having shown this in relation to a speaker and listener, the next step will be to look at whether the same thing happens with brain rhythms during a two-way conversation. Why are these insights interesting? 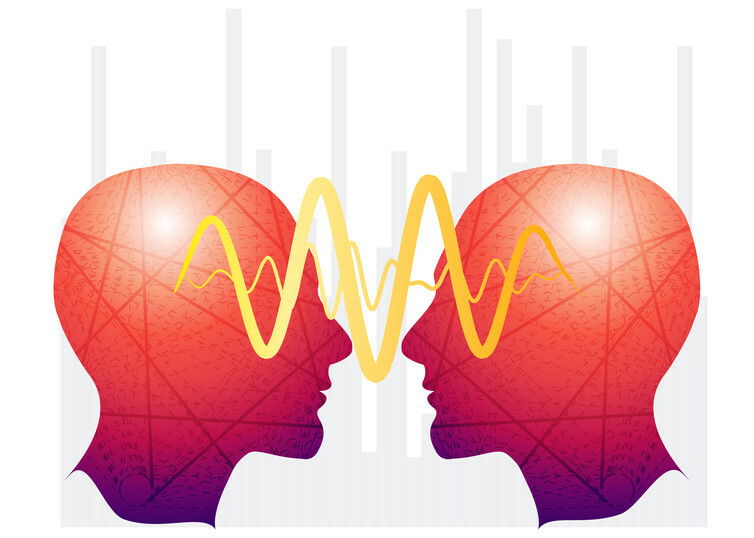 If it is correct that speech normally works by establishing a channel for communication through aligning brain rhythms to speech rhythms – similar to tuning a radio to a certain frequency to listen to a certain station – our results suggest that there are other complementary channels that can take over when necessary. Not only can we tune ourselves to the rhythms from someone’s vocal chords, we can tune into the equivalent rhythms from their lip movement. Instead of doing this with the auditory part of our brain, we do it through the parts associated with seeing and movement. And neither do you need to be a trained lip-reader to benefit – this is why even in a noisy environment such as a pub or a party, most people can still communicate with each other.